I’m going to tell the story of a new product idea from conception to death. I know that my first year or two of trying to vet ideas was a scary process to navigate. I felt like I was in a race car with an opaque windscreen and a vague impression that I needed to turn, but I never knew which direction or when. The uncertainty still plagues me, but I have developed some processes to deal with it. I’ve also learned that it’s more like a bumper car than a race car in most scenarios. It might be embarrassing or below expectations to crash, but there is little chance it will be fatal. It is also quite common to crash and you never get going quite as fast as you’d like. In September 2011 I created a small piece of code for a friend that allowed them to use Wufoo as a platform for graded quizzes. Before creating the project I investigated which form platforms had an API that I could leverage and as part of that I asked a few questions of someone at Wufoo support. I followed up with the completed project to the Wufoo contact in case it would interest them. That small thing allowed me to turn my README for the project into a blog post on the Wufoo blog. The blog post generated some inbound interest, but I didn’t start taking the idea very seriously until some of the interest turned into consulting opportunities. I figured a few consulting clients, a blog post, and some additional interest from the friend that started everything warranted more investigation. So, naturally, I made a few customer development phone calls to get more insight into people that wanted to solve this problem. I was able to isolate two interested segments: online education and marketing. I was able to get a collection of people in marketing to be moderately interested, but it seemed like education was the real player. I spoke with about 25 people over and above the 10 or so that had already come my way. I got really excited at this point and started to move things forward on multiple fronts. The consulting deals were done in such a way that I could keep the code open sourced and use it for any purpose down the line. I knew that I had wasted time on the technical side before when I should’ve started with marketing so I jumped in on the marketing side. The language and benefits were carefully extracted from many conversations, but I don’t think I’m good at this yet. I created a landing page. I used my contacts in the market to generate ideas for benefits and features. I iterated on the design and content with some trusted friends and advisors in the startup space. I bought a domain, picked a name, and did some quick and dirty keyword research. I enlisted some outsourced marketing help on oDesk. I had people tracking down competitors, keywords, blogs, hangouts, and the best content online in this market. That set me back a few dollars, but I was excited about my marketing approach. 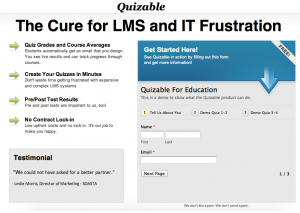 I had a demo that included a graded quiz and captured email addresses! It was whiz bang cool. I started planning out the future and wrote a 10+ page marketing plan. I had paying clients and interested potential customers. I decided to drive some traffic to the landing page to build a huge mailing list for my mega launch event. To drive traffic right away I turned to Facebook Ads where I figured I could effectively target young, web-savvy, educators. I also used BuySellAds paid tweets and I linked the landing page from my blog. I was banking on 10% conversion, but if it was a little lower I was willing to retarget and try some new things. I managed to convert 0% of the traffic. I spoke with a few advisors about the idea and the process I had used in depth. Everyone agreed that there was something to the idea whether it was lead generation or a simplified Learning Management System (LMS), but we also all agreed that it wasn’t quite there. The idea wasn’t fully formed. The traffic wasn’t converting. The test didn’t succeed. I’m not great at copy or paid search ads. I do think these networks have tremendous value, but I did not connect on this idea. I recently heard Noah Kagan speak and one of the best things in his talk was to set specific, challenging goals for tests and simply walk away when your expectations aren’t met. I walked away. I was sad to see an idea that I was so emotionally attached to go by the wayside, but you can’t make emotional decisions about which product ideas are worth pursuit. You make data-driven business decisions after you talk to customers, do market research, and test the idea by exposure. This is not something I could have done a few years ago. I try to pursue things that will leave me better off when it’s all said and done whether it meets my loftiest ambitions or it crashes ignominiously. I think this project meets that criteria well. I got the blog post. I tested another idea in depth and I’m getting faster, more decisive, and (I hope) more effective at it. I learned some new tricks for marketing, I wrote a great marketing plan that I can use as a template, I experimented extensively with outsourcing, I worked from the market side first, and I solidified my process of vetting an idea. I learned some great skills and a valuable lesson about getting too excited about an idea too early. I thought I already met that lesson, but here it is again. I spent $150 or so, and I saved months or years of chasing an idea that I can’t sell online with my resources and contacts. This is a key distinction. Someone may be able to execute on this idea. Maybe my failure is more due to my lacking copy or SEM skills than the idea itself. Perhaps I missed the number one benefit. In any case, I gave it my best shot and I know that this one isn’t for me. we only learn by doing. failing is part of the process. thanks for sharing this. good luck with your next idea! I often hear “fail fast” from the lean startup crowd, but I don’t often hear of how they failed fast. Thanks for sharing how you failed fast and didn’t waste a bunch of time. Previous Previous post: My daughter taught me to fail more.